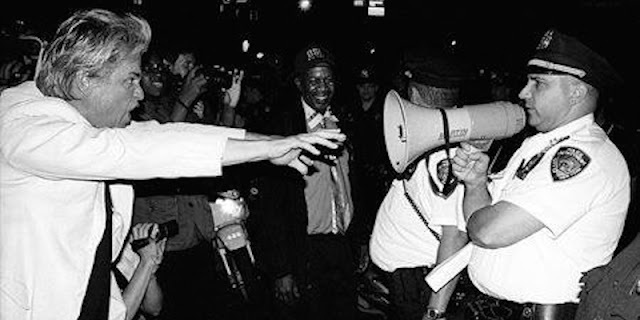 Sharing their opposition to Monsanto and Starbucks and Walmart, Reverend Billy and the 40 singing-activists join forces with the radicalized rocker on Tuesday, July 21, at Jones Beach Theater in New York. Accompanying Neil Young is the band “Promise of the Real,” with Lukas and Micah Nelson, sons of Willie Nelson. 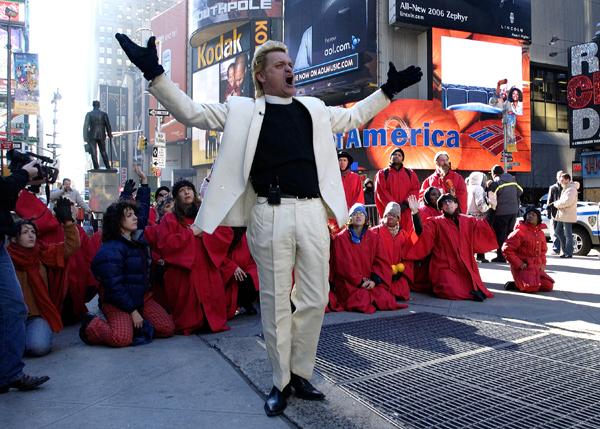 Reverend Billy and The Stop Shopping Choir perform "Spiritual Trespassings" in corporate spaces by day and sing on stage at night. This year, they kicked off their Faster! Monsanto Die! Die! Tour at Laurie Anderson's New York Live Arts Festival. They performed on stages in Austria, England, Ireland, New Jersey and Chicago. They also sang with Joan Baez at a benefit concert for Black Lives Matter activists. Reverend Billy and The Stop Shopping Choir have recorded three albums; their fourth album will be released this fall. The troupe is in residence at Joe’s Pub at the Public Theater, with eight Sundays this coming holiday season. 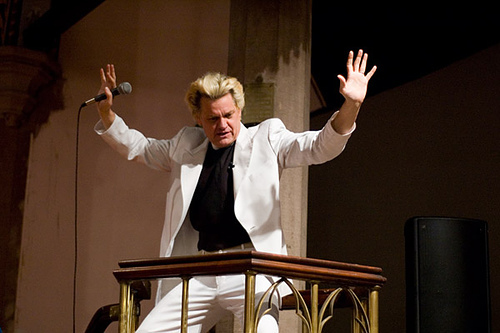 Reverend Billy and The Stop Shopping Choir are the subject of Morgan Spurlock’s second feature film, “What Would Jesus Buy?” and have the Obie and Alpert Awards. This summer, the Rev & singers will perform “Non-Violent Dramatic Actions” to support a ban on Monsanto’s Roundup, the world’s most frequently used herbicide. New York City sprayed Monsanto’s Carcinogenic Roundup more than 1,300 times on its parks and playgrounds in 2013. Glyphosate, the main ingredient in Monsanto’s Roundup, was declared a likely carcinogen by the World Health Organization. This spring, the singing and preaching activists invaded London’s British Museum for an unsanctioned concert against BP, a company that buys prestige by giving money to the old museum. During a recent trip to Chicago to lead the March Against Monsanto, they exorcised Monsanto from Home Depot and their new office building. They also visited the sacrifice community of Marktown, IN. This small town suffers extreme rates of cancers and asthma, living in the shadow of the largest tar sands refinery in the United States, the Whiting Refinery, owned by BP and the Koch Brothers.